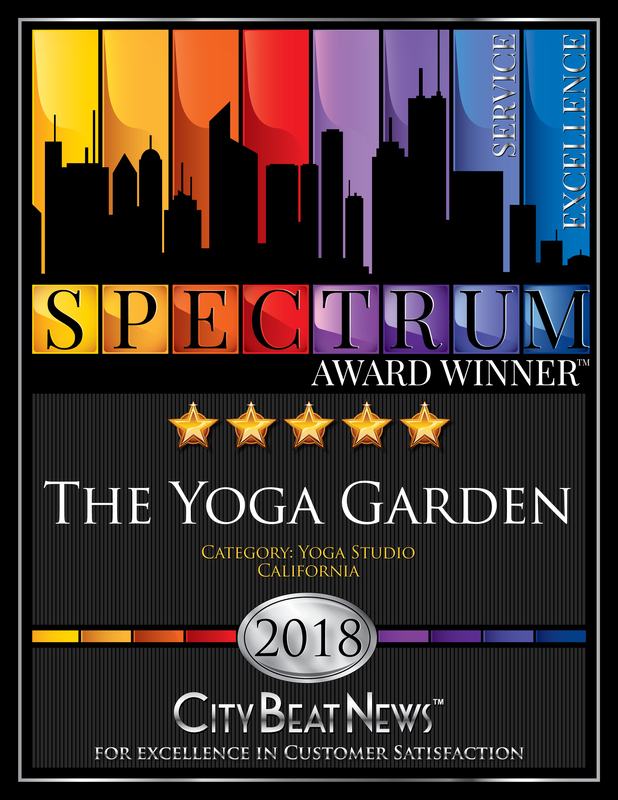 San Anselmo, California (April 13, 2018): 2018 Spectrum award winner, The Yoga Garden in San Anselmo, California, believes in the ancient virtue of Ahimsa – an attitude of universal benevolence and compassion. “Our students are treated with respect and integrity, and our intimate classes cater to the yoga that best benefits them,” explains Winkie Bresler, owner. This focus on compassionate practice is an award-winning business model according to the research of City Beat News which is charged with identifying small and medium-sized businesses throughout North America that deliver great customer experiences. Winkie continues, “The Yoga Garden loves its students, teachers, and friends as much as its friends, teachers, and students love the studio.” Yoga students agree, describing The Yoga Garden as “very calming, very peaceful, very special” and its classes as “individualized yoga in a group”. The Yoga Garden boasts a five out of five-star customer service rating for the past four years based on CBN’s independent market research using a proprietary rating algorithm to neutralize bias. For twenty years, The Yoga Garden has acted as a sanctuary to renew the mind, body, and soul. Located in the charming heart of San Anselmo, it’s an obvious choice for yoga students throughout Marin County and is easily accessible to those from Mill Valley to Kentfield, Fairfax to San Rafael. Its excellent reputation and strong social media campaigns draw students from elsewhere in the Bay Area along with dedicated, loving teachers willing to commute long distances because of their deep connection to the studio community. What began in 1998 as a warm, restful place to escape the demands of daily life has burgeoned into a dynamic studio with an ever-growing community of valued and dedicated members. Although the number of practitioners, teachers, and variety of classes has increased over the years, The Yoga Garden’s intention to foster a nurturing environment adapted to meet each individual patron’s needs and practice remains. This kind of connection creates an environment where students can build their practice through a series of regular classes, such as Wake-Up Yoga, Align & Flow, or Restorative Yoga, while enjoying endless opportunities to challenge themselves with something new. Winkie expanded the scope of classes, adding styles like Kaiut Yoga, Yin Yoga and Qi Qong. She also introduced special events that are popular with the community, like hosting a reposeful retreat at Rockpile Ranch as well a lecture with the esteemed Menaka Desikachar. In addition, clinics target specific issues – yoga therapy uses the safe, mindful application of yogic techniques for individuals facing health challenges like chronic pain. Yoga can be an effective, integrative therapy teaching simple but powerful movement, breathwork, visualization, and meditation tailored to each individual. City Beat News is a national research and publishing company providing a balanced, objective view of customer satisfaction through independent, annual research. Research findings are comprehensive, unbiased and accurate, and reflect ratings that give guidance to consumers with the credibility that powers communities and economics. By highlighting top-flight service with the Spectrum Award for excellence in customer service, CBN strives to strengthen the highest performing companies across the nation, along with the communities they support. Learn more about CBN at citybeatnews.com. The Yoga Garden is a boutique studio that specializes in yoga wellness to encourage everyday joyful, healthy living. The studio offers small classes, therapeutic clinics, and educational programs led by seasoned instructors. Customer loyalty programs include senior discounts, holiday discounts, new student specials and membership benefits, retention discounts, free birthday classes, and more. The Yoga Garden recently created branded apparel, available online, as a way to celebrate their 20 years as an engaged, growing yoga community. The Yoga Garden is located at 412 Red Hill Avenue, #12 in San Anselmo, California. For more information, visit the studio online at their website, www.yogagardenstudio.com, on their Facebook page or at their Spectrum Award page.